a Vendor Managed Inventory Model. Maintaining sufficient manufacturing and materials storage space is a common concern for many growing companies. 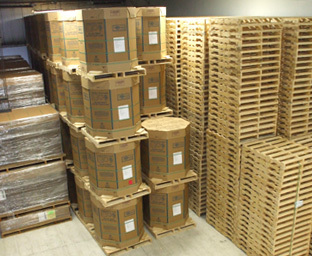 Under a VMI Model, Wood Products Corporation will monitor your packaging inventory and restock quantities when they fall below a pre-established level, allowing your company to keep less packaging materials on hand and devote more space to manufacturing. - Cost savings through advanced buying and planning. - Planned logistics allowing for for control of the time and size of replenishment. - Increased manufacturing space by decreasing inventories. - Improved on-time shipments to end customers. can customize a VMI Program for your company.